Even though Fall and Winter are my favorite seasons, I have to admit that I do love watching the flowers and leaves come back to life. What I am not happy about is knowing that the heat of summer is coming. I hate that. It was 80 here yesterday and I'm just not ready for that. I feel I was gypped out of a good cold winter. Anyway, for today's mani, we shall be paying homage to the new leaves and flowers blooming. First up, my cats will present the silly bottle shot. This is Checkers and Sam. They are showing you Elemental Styles Iodine-ing Out, Essie Navigate Her and American Apparel Hunter. I started with Navigate Her. I just love this light green but why are the lighter colors such a PITA to apply? Can anyone explain this to me? Here are your shots. It sure is pretty though! I then stamped with Hunter and plate DRK-A. Then I did a layer of Iodine-ing Out, did dots with my art pen and followed with my funky using Hunter again. Here are the results. Do you see that yellow shimmer? That's Elemental Styles color changing top coat! I am loving this collection! 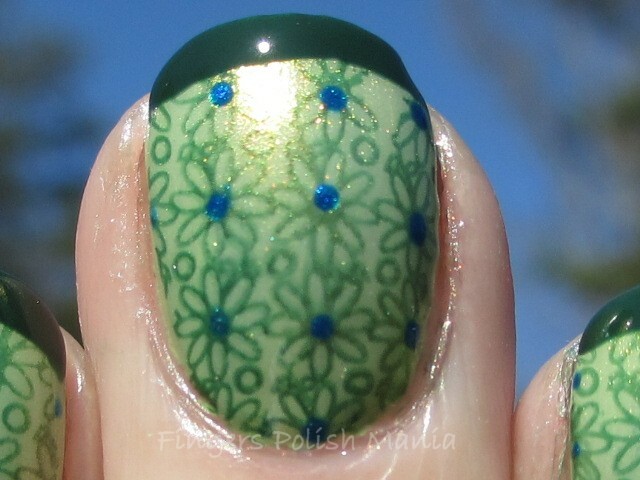 See how it changes Hunter from the flower stamp to the funky-that's the same color! It's truly pretty in the sun. I've been staring at my nails for days now. This has been my tribute to Spring. I may do more. Who knows?